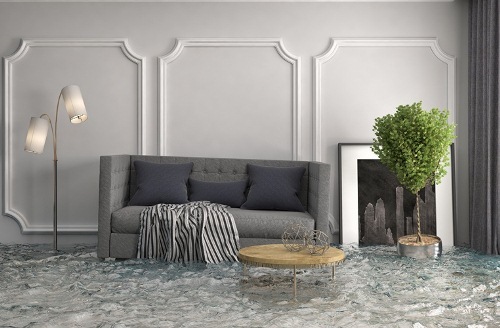 When a home is flooded, whether by heavy rains, burst pipes or a malfunctioning sump-pump, contaminated water and debris can wreak havoc on the structure of the house, personal belongings, and the health of the inside environment. Even an inch of water can ruin costly items such as flooring, insulation, appliances and furniture. A more severe flood may cause additional damage to your foundation, private sewage system, and electrical and HVAC systems. Once it is safe to return to your home, do not enter the house immediately. The building may not be safe or structurally sound. Walk around the outside of your home to check for loose power lines, gas leaks and structural damage. If you detect a gas leak or find downed power lines, call your utility company. If you notice any obvious structural damage that could potentially be unsafe, have a contractor or building inspector check the home before you enter. Secure the property so that no additional damage occurs by placing boards over broken windows and a tarp as protection if the roof has been damaged. Take photographs to show the insurance company that you have taken measures to protect your home against further damage. If the home isn't safe, do not try to stay there until it has been properly inspected. If you are able to enter your home, proceed very carefully. Even if the water in your home is clear, it could be contaminated by sewage or household chemicals. Wear protective gear like waders, waterproof boots, rubber gloves and face masks to avoid contact with contaminants while walking through or cleaning up a flooded home. Open doors and windows so that the house can air out before spending any length of time inside. Be sure to have a working flashlight to move around dark areas and turn off all water, electrical and gas sources within the home. Even if there is a power outage, the electricity must be turned off at the main fuse box to avoid mixing standing water and electricity in case the utility restores the power. If you have to step in water to get to your electric box, call an electrician rather than attempting to reach the box yourself. Your homeowners' insurance may cover flood damage due to storms, backed-up sewers and storm drains, broken sump-pumps or burst pipes, depending on what policies you have. Notify your insurer as soon as possible so that they can review the extent of your coverage. Before making any repairs, follow the insurance company's direction about whether or not to wait for a claims adjuster to inspect the property first. Document the value of your lost processions and photograph or video the damage before, during, and after the clean-up process. This information will support your claim and may also expedite the payout process. If your claim is covered, the insurance money will help get your home back in order quicker with less of a financial burden on you. Depending on the level of flooding you have experienced, it may be necessary to bail remaining water out using buckets and bins, or use a pump and attached hoses to drain large amounts of water. As the water begins receding, use a wet/dry vacuum to draw remaining bits of debris and moisture from carpets and floors. If the damage is minimal, you might be able to just use a mop to absorb any water. Even after you have removed all of the standing water from your home, everything will remain damp, especially if heavy rains have increased the humidity in your area. To prevent mold, which can develop within 24 to 48 hours of a flood, remove wet items, including carpeting and bedding, as soon as possible. If you have power, use your air conditioning and portable fans to help dry the wet areas of your home. Using a dehumidifier will help remove excess moisture from the air in closed off spaces such as basements or crawl spaces. If you're treating a larger area that has been flooded, you are likely to need multiple methods, including an air purifier to prevent the growth of mold spores and decontaminate the air in your home. Once the water is gone and your home is safe to enter, post-flood clean up can begin (unless your insurance company has instructed you otherwise). Determine what is salvageable and throw away anything that is damaged or no longer safe to use. Electrical and HVAC systems, electronics, major appliances and other household items will need to be inspected and carefully cleaned to ensure they are safe to use. Throw away all food, beverages and medicine exposed to floodwaters or mud, including canned goods and containers with food or liquid. Dinnerware, glasses, and flatware should be cleaned and sanitized before use. Items that absorb water and cannot be cleaned or disinfected such as mattresses, carpeting and stuffed toys should also be thrown away. Clean all hard surfaces (flooring, countertops, sinks, etc.) thoroughly with hot water and soap or detergent. Be aware that you may need to remove flooring, drywall, and insulation to prevent mold and mildew from spreading in your home. Furniture may also need to be dried out, cleaned or thrown away depending on the level of water damage. The quicker you remove items from water and begin drying them, the less likely they are to be lost to mold. To minimize any health risks, consider calling a professional company specializing in mold removal to assess the situation. These simple tips can help save you time, money and make the clean-up and repair process easier if you are ever faced with flooding in your home. If you or someone you know has been affected by the aftermath of Hurricane Harvey, please visit https://www.directenergy.com/harvey to learn more about the resources available to flood victims and additional information on storm recovery, billing FAQs, donations and more.